Regain your independence with a bath lift. 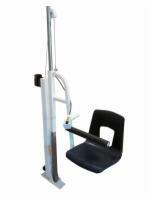 If you have difficulty getting in and out of the bathtub, you could benefit from a bath lift. Bath lifts are comfortable, lightweight, easy to install, and portable. Bath lifts install in minutes using suction cups that attach to your tub and use a waterproof battery pack and hand control to smoothly lower you down into your bathtub and raise you up again. Need help choosing a bath lift? Check out our Bath Lift Buying Guide. The Bathmaster Sonaris2 Bath Lift combines functionality, outstanding performance and great design to give the user a delightful bathing experience. The single-button operation allows the user to descend and keep the backrest upright or to recline back to a more comfortable position, while retaining ample leg room to relax in the bath. The all-plastic construction is easy to clean, and is strong and durable to ensure stability and years of use. Thank you for visiting the Bathtub Lift section of 4 Med Supplies. Bath lifts are meant to improve the quality of life of the person using it by giving them more freedom and the opportunity to bath more on their own. Selecting the right bath lift for you depends upon several factors. First of all, the most important thing for you to consider is your own environment. That is, what is the tub like you plan on installing the bath lift in and what is the person like who is going to be using it? Tub Size The standard tub size of 29” x 48” accommodates all of the bath lifts you will see in the 4-med-supplies.com bath lift store. Our bath lifts have flaps on each side of the seat that helps accommodate getting on and off the seat. Some of our bath lifts have a seat that swivels. In this scenario, the user has the option of using the bath lift to aid them in standing and then stepping out of the bathtub. There is also the option of remaining seated and sliding their legs over the side of the bathtub and then stand outside it. Large tubs and Jacuzzis may only provide the option to stand inside the tub. Size & Weight of the Person Different bath lifts have different weight capacities. Our bath lifts range from a maximum of 300 pounds to a maximum of 375 pounds. In addition the size of the seat is important. As mentioned above all of our bath lifts have flaps on the side of the seat and some rotate. The size of the seat and flaps may not be enough to get a person out of the tub comfortably and standing up in the tub may be a requirement. Additionally, you will want to consider the lift range, how the lift attaches to the tub and the number of lifts per battery charge. Lift Range The lift range is determined by how low in the tub the seat will go to how high it will rise. This determines how high the unit will sit above the tub or how low into the water it will take you. Our lifts have different ranges to fit your needs. Placing a call to our call center and speaking with one of our representative will aid you in this decision. Each bath lift is supplied with a hand controller unit. Some of them float. Press the "Up" and "Down" buttons to get in and out of your tub. Attachment All of our lifts come with suction cups that keep the lift from moving around inside the tub. If your tub has an irregular surface the suction cups may not work as expected. If this is your situation, you can speak with one of our representatives about special suction cups that may work for you. Battery Operation All of our lifts are battery operation for you safety and convenience. The number of lifts per battery charge is dependent on the weight of the person using the lift and the age of the batteries. Some of our lifts provide battery indicator lights to help you determine when a charge is needed. Finally, an obvious consideration is cost. Cost is more than price. At 4-med-supplies.com, you are guaranteed the lowest price. If you find any of our lifts advertised for a lower price than you can find it on our site, let us know and we’ll not only match it…we’ll beat it. Cost is more important because it includes the price of your unit, shipping, special warranty, and return fees if there is a problem. At 4 Medical Supplies, you never pay for shipping in the continental US and we have one of the best return policies on the internet. Also, all internet dealers are bound to follow MAP pricing. This is the minimum advertised price a dealer can use to advertise a product. In some cases, our call centers have special pricing that is lower than our advertised price. We have call centers across the country and they are open to serve you.